Shane's Chess Information Database (or Scid) is a popular free UNIX, Windows, Linux, and Mac database application for viewing and maintaining databases of chess games. Scid development has been resumed after it ceased in 2004. There is at least one other project making use of Scid code - ChessDB. Scid supports portable game notation and its own Scid database format. 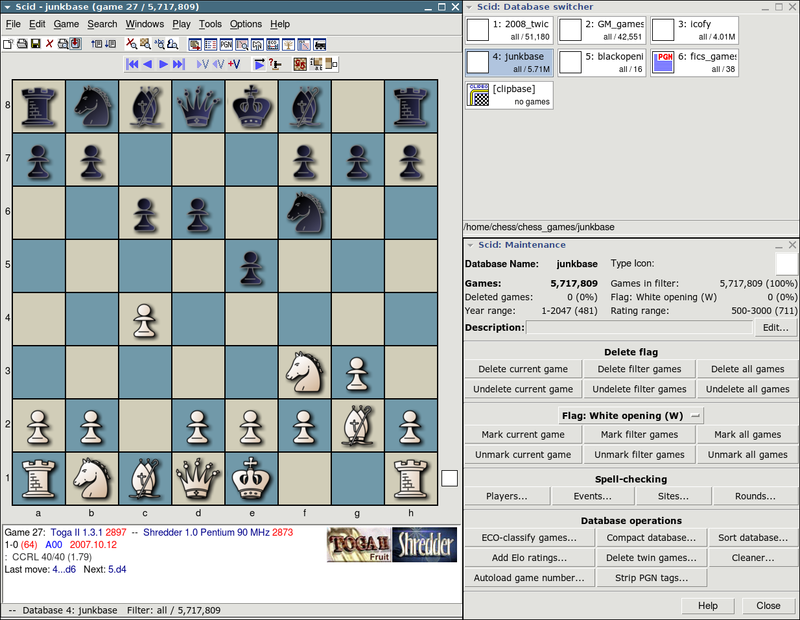 It can be used with chess engines with support for Winboard such as Crafty and GNU chess, and with UCI such as Fruit, Rybka and Shredder to play chess against or to analyse games. Scid can use up to five piece endgame tablebases. Photographs of players may be stored in the database, so they are shown when a game is played.